WASHINGTON — In a surprise move, President Obama announced Thursday he is seeking a two-year extension for FBI director Robert S. Mueller. The move took many by surprise considering a search was underway for a replacement for Mueller whose 10-year term was coming to an end in September. “In his ten years at the FBI, Bob Mueller has set the gold standard for leading the Bureau,” President Obama said in a statement. Mueller sent an email to agency employees notifying them of the White House’s intentions and saying that he would be honored to serve. The move saves the White House any confirmation battles on Capitol Hill where Mueller seems to enjoy strong support. However, that being said, there were a lot of pretty safe candidates being mentioned as possible replacements. Still, the Congress will have to pass some form of legislation to deal with the the extension since the current law specifies that an FBI director can serve only 10 years. The Senate Judiciary committee said Sen. Patrick Leahy (D-Vt.) is looking into what needs to be done legislatively to address the issue. 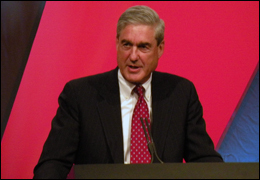 A Congressional aide said that Congress could pass a law changing the term limit for the FBI director or pass narrower legislation just to deal with Muller’s circumstances. The reactions were mixed at the FBI. Some people were happy. Others had been looking forward to a change. And still others offered pros and cons to the move. Posted: 5/12/11 at 1:19 PM under FBI, News Story.